Kaulen card: Tim Kaulen's "Giraffe" at the Pittsburgh Center for the Arts. The characters staring down from the walls of the Pittsburgh Center for the Arts are familiar to many Pittsburghers, even some who've never set foot in a gallery: Gas Girl, Bull, Goose, Scare Crow, Turkey Lady; the Space Monkey, Rankin Deer and Walking Stick Rocket. These inhabitants of the Pittsburgh mythology, members of the same race of Giants that begat Gargantua and Pantagruel, have watched our city change over 20 years. They've watched from abandoned gas-station marquees, the walls of half-demolished buildings, and the Birmingham Bridge; from the outside of the Carnegie Museum, the Three Rivers Arts Festival and the Children's Museum. 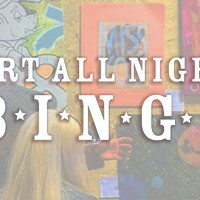 Garden of Earthly Delights, the current show by Pittsburgh Center for the Arts Artist of the Year Tim Kaulen, represents not just the story-so-far of one of the city's most important artists, but an entire school of the city's artistic life. It's a generation of artists who helped carry Pittsburgh from its ambiguous late-'80s and '90s flux into the 21st century's begrudging acceptance of Pittsburgh as a city on the rise. As a celebration, Garden documents the work that Kaulen -- and often his collaborators -- has done in the past. Due either to their size or their ephemerality, these works are documented mostly in photographs that stand alongside new work showing an artist growing in scope and talent, while maintaining his conceptual orientation. An archival image of an older Kaulen work, "Dove." Kaulen's work began to appear around the city in the early 1990s. 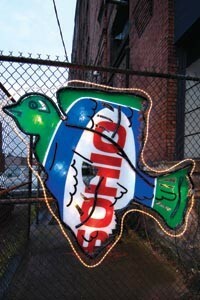 Pieces like "Gas Girl," the head of an Americana-style woman made from reclaimed plastic advertising, which appeared on the front of a closed Stuckert's auto-service building. And "Bull," which hung from the Birmingham Bridge long enough that, once removed, it became a part of Pittsburgh's notorious tradition of giving directions via missing landmarks. 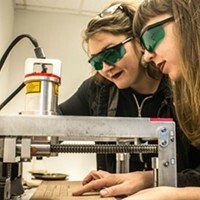 Meanwhile, working with a group of like-minded artists under the banner of the Industrial Arts Co-Op, Kaulen began collaborating on larger-scale projects, often using reclaimed materials from Pittsburgh's industrial past. At the abandoned Rankin steel mill, a gigantic deer's head appeared, made from twisted metal left behind when the site closed. The 20-foot-tall "Walking Stick Rocket" and still-in-progress "Southside Works Sculpture" project -- a stories-tall sculpture of two steelworkers built from reclaimed mill materials -- represent the Co-op's steps toward iconic, landmark sculptures that are commissioned for permanent, sanctioned placement. Likewise, Kaulen's own work has become broader in scope and intricacy, though still within the conceptual vein he's mined so productively. 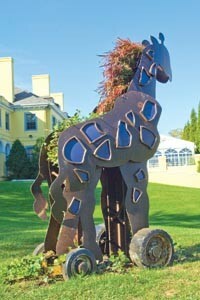 Garden includes three new large-scale sculptures on the PCA's lawn: "Horseman," "Giraffe" and a new variation on his "One Tin Duck" motif. Combining the two-dimensional cut-out icons with the fuller IAC sculptures, these new pieces mark a summation of Kaulen's ideas: Rusted steel painted to burst with colors, they act as topiaries, holding soil and plants, leafy vines spilling over their edges. Left on their own, they'd disappear into their own overgrowth, steel-toy Tintern Abbeys. Kaulen's work reflects an ethic that proved vital to Pittsburgh's transformation in the 1990s and early 2000s. That was -- and continues to be -- a transformation powered by start-up companies, galleries, arts and neighborhood organizations activated not by funders and government, but by individuals and collaborations responding to a perceived need in the community with a passionate, almost obsessive love for the city. Kaulen's work remains street art, but by no means vandalism. It's artwork fueled by a sense of ownership over the city -- not just the grid of its streets and buildings, but of its very mythology. "If you leave a building abandoned," Kaulen and his cohorts seemed to say, "we claim the right to build on its face. If you leave our fathers' mill-site legacies to rust, then you forfeit those artifacts and their history to our artistic needs." This is artwork that re-imagined Pittsburgh's postindustrial legacy as Carnival -- a "world turned upside down," overrun by the untamable evolutionary spawn of advertising and industry, composed of billboards, rusted metal and children's-toy iconography. It became a part of the ghostly map of Pittsburgh myths and legends, a map from which people unfazed by industrial decline could begin to recreate the city. Perhaps most importantly, Kaulen's work speaks to the gut and not the brain. Rather than some grossly overt political statement, like some of the period's street art, Kaulen's work rebels with a carnivalesque laughter -- childlike, but not childish. If "Bull" could speak, I imagine he'd tell us, in a swaggering boom, that, "laughter makes men human, and courageous."